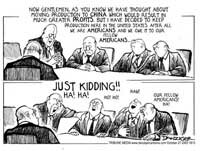 The following cartoons were purchased from Jeff Danziger. Each cartoon is copyrighted. These cartoons may not be reproduced from this website. In order to use the following cartoons, you must contact Jeff Danziger directly, care of Cartoonists & Writers Syndicate / CartoonWeb.